Celebrity chef Anthony Bourdain walks with Chef KF Seetoh to visit the World Street Food Jamboree at the MOA concert grounds in Pasay City, June 1, 2017. Photo by Bernard Testa, InterAksyon. 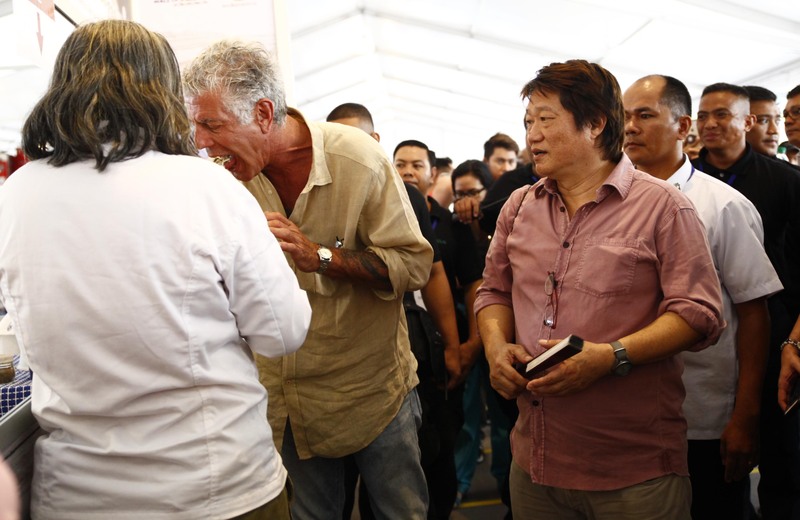 Anthony Bourdain, of course, needed no introduction, but on Thursday afternoon, Chef KF Seetoh, introduced his good friend to the audience at the World Street Food Congress (WSFC) 2017 Dialogue as a supporter of street food. 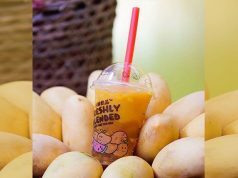 Bloggers, members of media, and fans were star struck as the celebrated street food enthusiast gave a talk on the second day of WSFC in Pasay City. 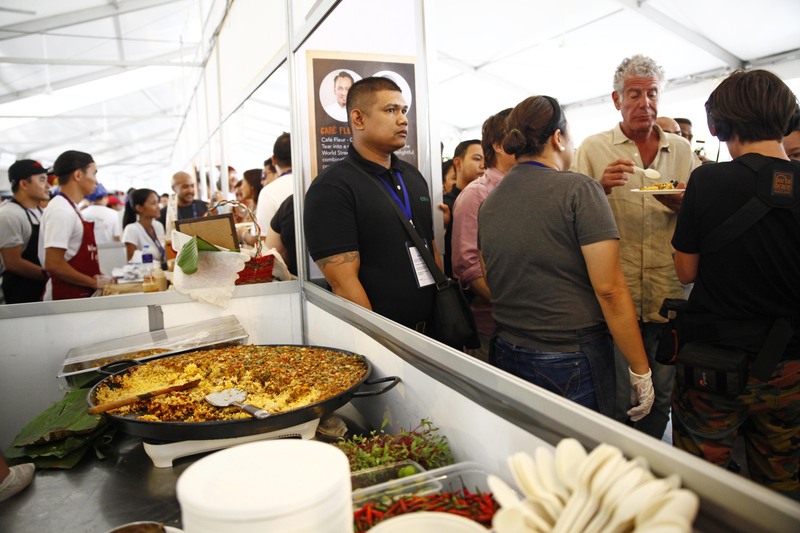 Bourdain was joined by other Michelin-starred chefs at the congress, which has “Re-imagine Possibilities” as this year’s theme. “Imagine a place without food,” said Bourdain, revealing that he travels 250 days in year for the past 17 years and that he is still searching for the perfect meal. “I would not want to bring chicken rice to New York because I will not have an excuse to visit Singapore,” he added. With his opening remarks—where he shared that he loves coming back to the Philippines, his children knows Jollibee in New Jersey—loud applause and cheers was extended to him by the audience. 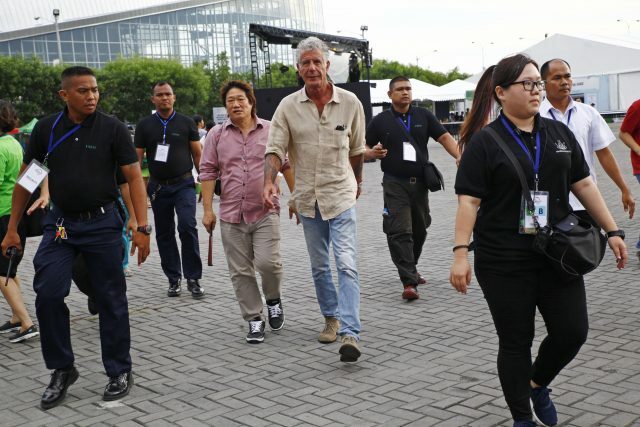 After his talk, Bourdain visited the World Street Food Jamboree and tried Filipino dishes like Sisig Paella, La Paz Batchoy, a burger from Singapore, and a stew from China. 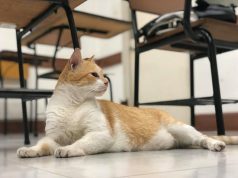 It was really a quick tour, with 10 uniformed security personnel and two policemen escorting him as part of the event organizer’s crowd control efforts. There was no way that a fan could get close to Bourdain for a photo opportunity. Yet, his fans didn’t mind as the celebrity chef was his usual cool self (despited the heat), smiling back at those who catches his eye, and even signing his book upon the request of a fan. Here some scenes from yesterday’s World Street Food Jamboree visit. Celebrity chef tastes ‘sisig’ paella by Chef Sau del Rosario. Photo by Bernard Testa, InterAksyon. 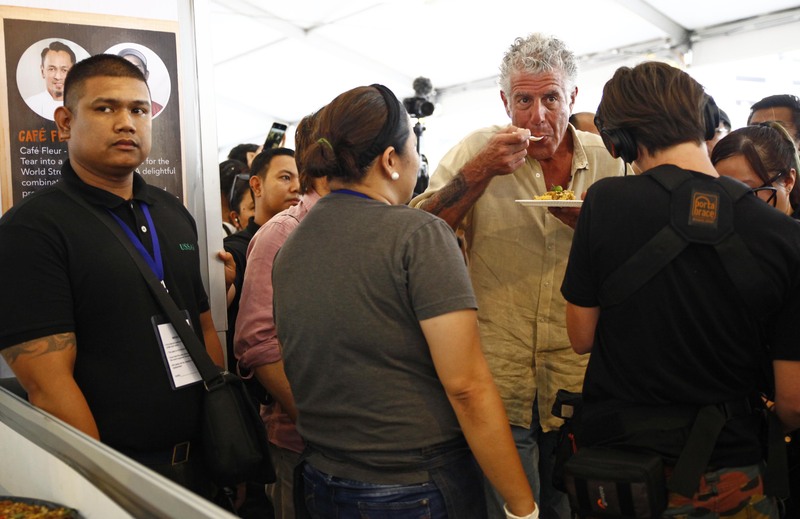 Celebrity chef Anthony Bourdain tries La Paz ‘batchoy’ from Iloilo City. Photo by Bernard Testa, InterAksyon. 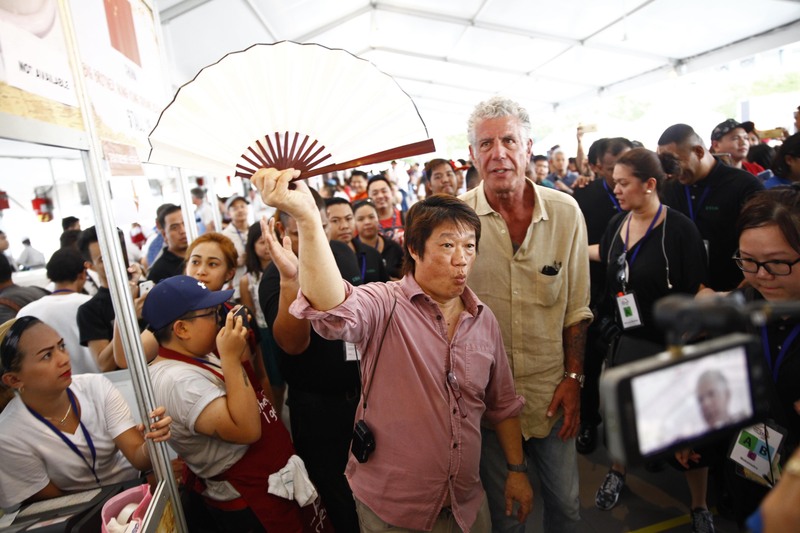 Chef KF Seetoh and Anthony Bourdain cool themselves with a fan as they go through the World Street Food Jamboree stalls. 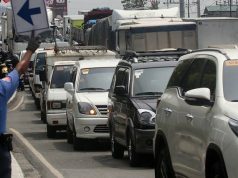 Photo by Bernard Testa, InterAksyon. 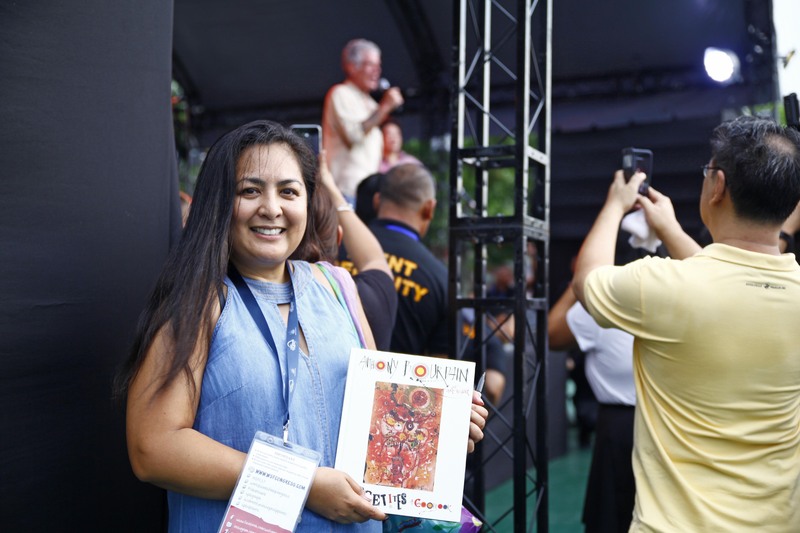 Joycelyn dela Paz shows her Anthony Bourdain book signed by the celebrity chef at the World Street Food Jamboree. 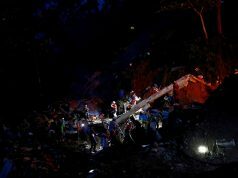 Photo by Bernard Testa, InterAksyon.